We received this product for review purposes. As always opinions are honest and those of JustaBXfamily. This post contains affiliate links. I have a confession to make. When JustaBXgirl was born I didn’t think too much about car seat safety. We didn’t have a car at the time and all I knew was that I needed to have a car seat to bring her home in. When we got a car (I still don’t drive) but JustaBXgrandpa does, I just stuck with the seat I brought her home from the hospital in. Here’s the EvenFlo EveryStage as an infant seat. It amazes me that this seat really works for all ages! When she outgrew that seat her dad ordered her one as a gift for her first birthday. He didn’t ask me which I wanted and I just accepted the one he sent. It worked, she liked it and I again didn’t think too much about it. Some of you might remember that JustaBXgrandpa had a car accident about two years ago. After that, I was a little more savvy so I did some research before replacing her car seat. I loved the replacement seat. Only problem was it was HUGE. Even in our seven-passenger minivan, it took up too much space. And JustaBXgirl was getting a little long for the seat. 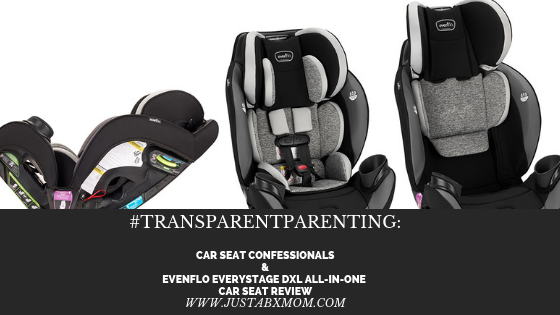 I was so happy to find the Evenflo EveryStage All-In-One car seat at this year’s NY Baby Show. This seat is the last car seat JustaBXgirl will ever need. And it makes her feel like a big girl. She’s gotten some gentle ribbing from her cousins because most of their parents allow them to ride without the added support. Since having her, I have learned how very important having the correct seat is. I have learned so much and it has scared me. This little miss will be in a car seat until she has her own baby! Seriously though, a lot of us rush our littles out of car seats because we think they’re ready. Or because the little complains about having to be strapped in. Or because the little has mastered unstrapping the restraints. I always tell JustaBXgirl one of my most important jobs as her mama is to keep her safe. Using the Evenflo EveryStage All-In-One car seat I am doing my job. I am keeping her safe. I also love that if she’s not in the car but one of her cousins is this seat can be used for them as well! I’m talking her one-year-old cousin, four-year-old cousin, and even her eight-year-old cousin! I know that sounds crazy but it is true. This seat is truly for every stage. And it is easy to convert. JustaBxgirl loves it as well. I think she was ready to get out of the previous seat because it made her feel a little bit like a baby but with her being so petite I wasn’t ready for her to be in a full booster yet. This seat takes up so much less space than the one we had before and JustaBXgirl said it hugs her when she sits in it. She loves the two cup holders and made the rule that nobody else in the car can use them. She also has finally been able to lock and unlock her own restraints. I know for some parents this is scary but I have drilled into JustaBXgirl the importance of her car seat so she only releases the restraints once I’ve given her permission. And she gets the feeling of being in a booster with the support of a car seat so this mama is happy. She’s still right under forty pounds and this seat can be used up to 120 pounds so you might think I’m joking but she really will be in this for years to come. Rear-facing mode: 4-50 lbs. and 17-48 in. Forward-facing mode: 22-65 lbs. and 28-49 in. Booster mode: 40-120 lbs. and 44-57 in. And if you ask me this is the perfect time to make sure your little is in the right car seat. We don’t always realize how much our littles have grown and we don’t always pay attention or remember the guidelines on their car seats. Just me? I highly doubt that. If you haven’t recently, this is a great time of the year to review the height and weight guidelines that came with their seats. For those parents dealing with their littles pushing back on being in a car seat make it special. I remind JustaBXgirl that her car seat is her throne. She is the princess and it is her special princess chair. I also point out the differences in being in it to being directly on the backseat of the car. By making her car seat special she looks forward to sitting in it. What’s New With Baby Magic?